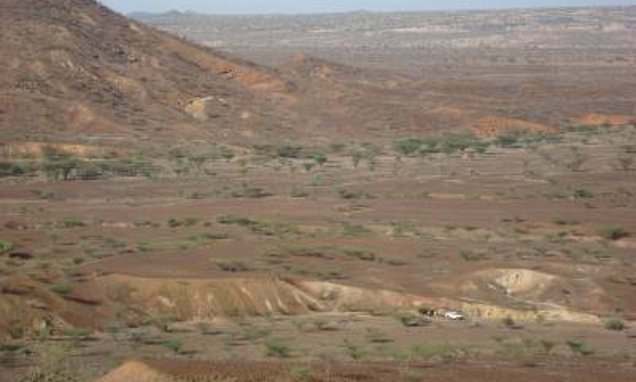 A fossil from a newly discovered species of monkey that lived in Africa 22 million years ago is a 'missing link' in primate evolution, say scientists. The extinct monkey fossil was found in the badlands of northwest Kenya and was first mistaken for a pig because the specimen was so primitive. Scientists say the teeth, from the species Alophia metios, helps fills a six million year gap in the fossil record. Professor Ellen Miller, of Wake Forest University in Winston-Salem, North Carolina, explained: 'These teeth are so primitive when we first showed them to other scientists, they told us, 'Oh no, that isn't a monkey. It's a pig. The newly identified monkey's teeth are more primitive than geologically younger fossils. This suggests it lived the 'good life', taking advantage of the vast variety of fruits, seeds and nuts growing in the rich forest. It sheds fresh light on the mystery of how prehistoric monkeys expanded their range across the Old World. The teeth of Alophia metios were unearthed in rocks exposed in the eroded desert badlands of north-western Kenya near Lake Turkana. Crucially they have been dated exactly between 19 and 25 million year-old fossilised monkey teeth found in Uganda and Tanzania, respectively. The latter is believed to have belonged to the world's first monkey. The study published in Proceedings of the National Academy of Sciences also suggests the course of their evolution was changed by their diet.